National Artist for literature Francisco Sionil Jose was born exactly 87 years ago to this day in Rosales, Pangasinan. I interviewed him two years ago, at the height of the controversy created by President Arroyo’s list of National Artist awardees for 2009. 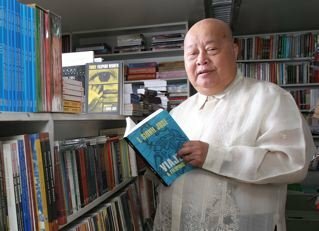 Dubbed as “The Old Man of Philippine Letters,” F. Sionil Jose talked about how he wants to be remembered, his frustrations, and his advice for young writers. He wrote stories and believed in them. This, according to National Artist for Literature Francisco Sionil Jose, should summarize the way he wants to be remembered. Those seven words, he said, would be engraved in his lapida (tombstone). He refused to elaborate on it though. Turning 85 this December 3, Jose said he’s already “waiting for the final curtain.” In the meantime, he’ll continue doing what he does best: write. Clad in a loose blue polo shirt with a baseball cap one Tuesday afternoon, Jose said he’s currently working on two things: a review of the Jose Rizal novels and the first draft of another novel due in 2010. “That’s why you have to be fast with your questions,” he said in an interview at his Solidaridad Book Shop in Ermita, Manila. He also writes a weekly piece for Philippine Star. He explained that because “millions of brain cells die every day,” one has to keep his mind working to delay its deterioration. A night person, Jose said he typically writes his pieces between 2:00 – 6:00 AM. Already way past the retirement age, one can only wonder what fuels Jose’s drive to write more. “A writer is only as good as his latest work. Passion for what you do is important. And of course, nobody is going to tell me to stop,” Jose said. He added though that he’s having some trouble remembering words right now. At 84, he said he feels a deep sense of frustration for the Philippines. Though his works dwell on poverty and social injustice (especially in the Rosales saga), he feels that “parang walang nangyari” (as if nothing changed). “I’ve known this country since the pre-World War II days, and there were fewer Filipinos then. Now, all I can see is pervasive poverty. What have I done?” Jose lamented. He then pointed out his humble beginnings by saying that ”putik ang pinangggalingan ko” (I was born dirt poor). Jose described comics-creator Carlo J. Caparas as someone who doesn’t think about his creations. “There is no movie of Caparas that I have watched in its entirety. I always walk out. He doesn’t flow the logic of narratives,” Jose said. Using the classic movie Panday as an example, he called the Caparas’ story writing illogical. “You cannot use branding iron on a man. We’re not cows! And if you burn a man’s skin, it would be infected,” he said. “Then, women in the provinces never swim by themselves during the 1970s. They only swim when they’re with other women,” the Rosales, Pangasinan native said. “As for me, I always think very hard when I write,” Jose added. He shrugged his shoulder and hand-gestured when queried about what being a National Artist means to him. “It’s no big deal. But I’m thankful for the accolades that come with it, especially for a writer with no steady source of income (like me),” he said. “The awarding of the title (as National Artist) on F. Sionil Jose affirmed what readers of his novels from different countries all over the world has contended – that Jose is a major Filipino writer who has something valuable to say to readers outside the country,” Lumbera said. Capili noted that Jose revitalized Ilocano literature by writing his narratives in English. “His greatest legacy would be the breadth and scope of his works as a journalist and creative writer. He introduced the Philippines to different countries,” Capili said, noting that Jose’s works had been translated in 30 languages worldwide. The literature professor added that Jose played a key role in integrating writers from Southeast Asia for many years now. “He organized international writers’ conferences and gathered writers and intellectuals to help conceptualize Southeast Asia as a distinct region vis-à-vis East and South Asia, way before ASEAN (Association of Southeast Asian nations) was established,” Capili said. Jose, however, downplayed the international acclaim that he has received for his works. “I’m happy to be read by foreigners but I’m not writing for them. I’m writing for the Filipino people,” he said. The man who claimed that he once considered committing suicide due to life’s disappointments would indeed leave behind a huge void in the Philippine literary scene, if the curtain finally closes. PS: This is probably the most memorable interview I’ve done so far. I told him that I first read his works while in secondary, and he responded that my alma mater Ramon Magsaysay High School is one of the best schools in the country. He also told me that to be more successful as a journalist, I must understand the past first (I am now taking my masters in history). 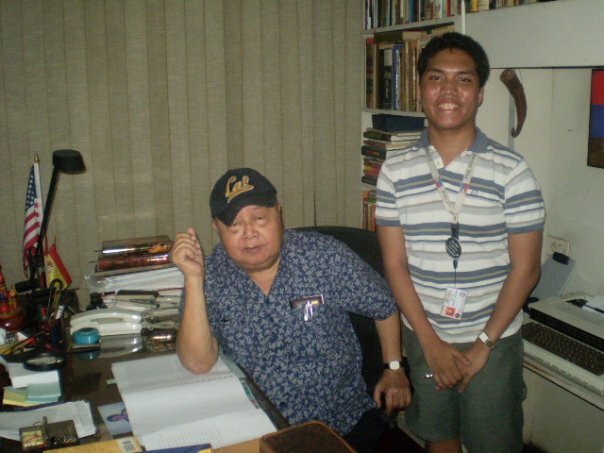 This entry was posted on Saturday, December 3rd, 2011 at 7:25 pm	and tagged with Bienvenido Lumbera, Carlo J. Caparas, F. Sionil Jose, feature stories, interviews, Jose Wendell Capili, National Artist for Literature and posted in history, journalism, philippines. You can follow any responses to this entry through the RSS 2.0 feed. « Best Text Blog winner, 7th PopDev Media Awards!